Operation Alamelamma had created waves with its captivating trailer and the movie does not disappoint. There is freshness in depicting the love blooming between Purmy, who is doing odd jobs to make a living and Ananya, a school teacher. Purmy's love for branded items makes him fall in love as well as fall into the hands of police on charges of kidnapping. As you might have guessed, it is a suspense thriller, which Suni has handled well. I kept guessing who the culprit was till the end of the movie and was wondering why the name Operation Alamelamma? Apart from the suspense, which keeps the audience glued, it is Bengaluru's flavor which instills the spirit of our beautiful city. Visit to buttefly park and museum and trek to avalabetta bring back happy memories. Film takes a dig at popular Kannada serials with references such as Vayusaakshi and Amruthadarshini, which is hilarious! Candid market scenes is another way to depict the way of life in Bengaluru. The song Alaga alaga is melodious. I particularly liked the line comparing heroine to Brihma Kamala (Epiphyllum oxypetalum), pristine white flower which blooms in the night. Another song Tili Sanje depicts the comical way of life of the characters, which is too good. Cinematography is excellent too, with aerial shots of Bengaluru coming out very well. Manish Rishi, the hero, who is making a debut does well to balance the innocent, comical and witty acts. Shraddha Srinath, as a bold and talkative girl impresses too. Finally, how can a Suni movie be without punchy and witty dialogues? They are seamlessly integrated in this suspense thriller unlike his Simple Love Stories, where they stood out sidelining the plot. On the other hand, authentic Kannada dialect from Mangaluru has been used for comedy, which is been blended nicely. Seems like authentic Mangaluru Kannada dialect is the flavor of the season. Though at some places in the movie, dull moments are felt, it is the pace of the story which keeps the audience moving. Overall, a good movie to watch! Ondu Motteya Kathe - Subtle, Humorous and Full of Life! If I tell Ondu Motteya Kathe is about candid confessions of a bald guy, I would be understating. Because it is a movie with subtle humor throughout and full of life. With characters so genuine, dialogues so candid, it is an experience of living the movie rather than watching it! Janardhan, a Kannada lecturer, is unable to find a suitable match because of his bald head – a prevalent problem these days! His search for an ideal match reveals his own inner self. He discovers that not only there are societal prejudices against him but also he has been harboring preconceived notions. That part delights and the viewer lives the character! Humor keeps the viewer glued as Janardhan narrates his kathe or story and evoking humor is done effortlessly! Dialogues from every day life manage to tickle the funny bone hard. A guy exaggerating the deeds of an astrologer, Janardhan’s relentless efforts to look good, be good and find a companion, his parallel efforts to be away from the clutches of moha or delusion and bits of Dr.Raj’s songs at right junctures have come out very well. Though the movie echoes the universal theme - beauty lies in the heart, it is in its sensitive presentation, Ondu Motteya Kathe scores. Subtlety is found not only in humor but also in how the characters interact. For example, the hero’s brother though exists in frame from the beginning but their interaction happens only in the second half. But they do communicate non-verbally or using monologues. In some scenes, I could also find different dimensions. For example, a character says Janardhan is not married - because in addition to he being bald, he is an Indian language lecturer too! Also, in the age of social media, how excitement and anxiety follow each other! Probably this is the only movie in Kannada, which has used the Kannada dialect from Mangaluru throughout and in its authentic form. Not only the dialogues but the life of coastal Karnataka comes alive in the form of ritual vows to deities, reference to jobs in gulf nations and more importantly, through congenial courtesies! Such a sensitive portrayal is a reason to cherish and is a sure sign of arrival of great movies in Kannada. Neenire Saniha Neenire is another popular song from the super hit Kannada movie, Kirik Party. Arya infatuated by Karna, the protagonist, is delighted and sings this song. The song contains finer elements of budding love. Translation : wooh... am I becoming shy and get frozen? Translation : draped colors to the soothing rainbow? Translation : how they could know the colorful moonlight! Translation : O my heart. Translation : have I turned into a shy peacock, mesmerized by you? 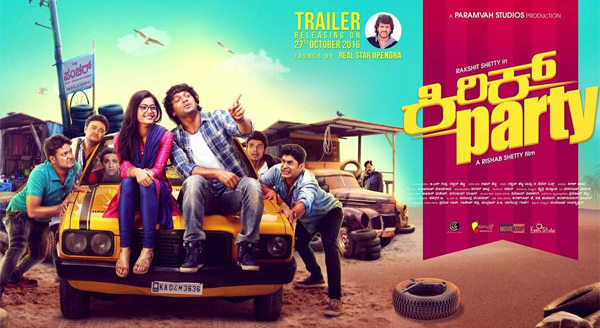 You can read the review of the film Kirik Party here. You can view the song in the following youtube link. How to replace the BESCOM meter, which stopped working? BESCOM meter of my house stopped showing no reading on display screen. It showed a blank screen. So, I had to replace it. Here are the detailed steps, I followed to get it replaced. Note : If the BESCOM meter stopped working within 5 years of installation, then it will be replaced free of cost by BESCOM, as it comes under warranty. If not, one has to purchase a new one and install it. On enquiring in the Soujanya Counter in BESCOM office, I was asked to meet the JEE (Junior Engineer Electrical). He asked me to get the form for granting permission to purchase the BESCOM meter. Above is the form you should get. The form would be available in Karnataka State Licensed Electrical Contractors Association office, which would generally be near to BESCOM office. 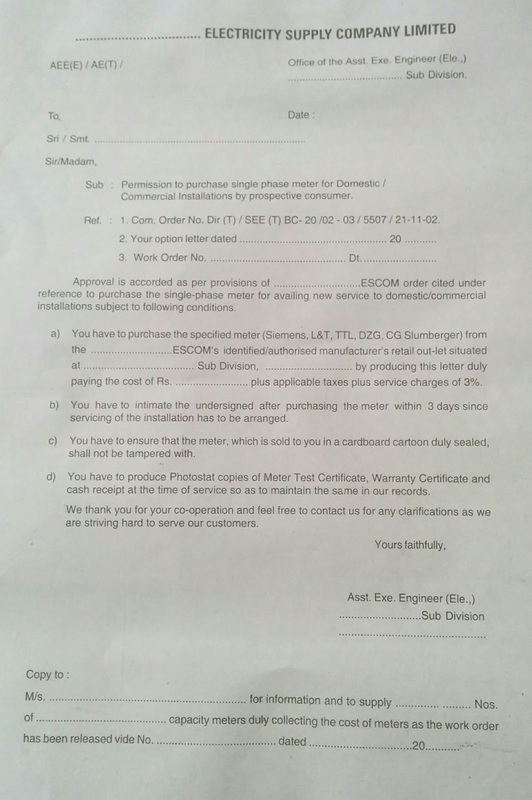 This form would be filled by the JEE indicating he has granted permission to procure the BESCOM meter. JEE will fill and sign the form and will tell where the meters are available. Hand over the form filled by JEE and procure the meter. It would be good keep a photocopy of the letter, as the original letter will have to be submitted. 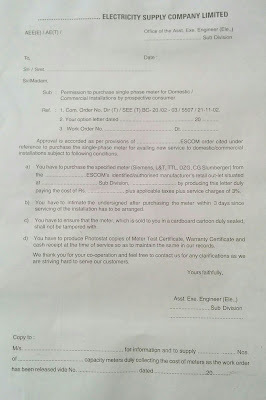 Get the purchase bill and check the carton box containing the meter has Test certificate issued by BESCOM and warranty certificate. Come back to local BESCOM office and get the meter registered by JEE. Get the lineman to your location to install the new meter. Old meter has to be handed over to the lineman. You don't have to pay any bribe to get your BESCOM meter replaced. It takes a bit of patience and diligence to get the thing done. JEE may not be available in his office all the time. So, you may have to wait and but do not loose patience! Even if it is a Saturday, office will be open till 5 30 pm. Keep the original receipt of purchase of meter, as it would be required to claim warranty later. Keep copy of grant letter and original test and warranty certificates with you. Kaagadada doniyalli is a popular song from the super hit Kannada movie, Kirik Party. Dejected Karna, the protagonist goes on a bike journey to find answers within. The composition, kaagadada doniyalli is a very touching song in such a situation. Translation : is it time for me to go on a voyage in a paper boat? Translation : has a drop of my unshed tears, turned into a pearl? Translation : have I become lighter? have I found a calming shore? Translation : am I a barefooted child in your lap? Translation : have I become bit more generous? is my home visible now? Translation : have I found my next path... beyond my imagination? That's the only wonder! Hair loss is a constant worry for men and women alike! To cash in on this problem, an entire industry has been set up. Many products are sold, promising prevention of hair loss and renewed hair growth. But do they really work? Here, is my humorous talk on these products. I gave this talk in my Toastmasters club, ORA*TORS. It is part of Competent Communicator certification offered by Toastmasters. Hope you enjoy it. Disclaimer : This post is intended for entertainment purpose only. Product names used here are just for evoking humor! I am not for or against any of these products! I have observed how people blindly follow navigation apps while driving, without bothering to notice the landmarks or use their natural ability to navigate. I believe that this habit is slowly eroding our natural ability to navigate. Now, it has been confirmed by researchers in Royal Institute of Navigation, London. In my following speech(of 7 minutes), I present three simple steps to retain our natural ability to navigate, even when we are using the GPS based navigation apps. I gave this talk in my Toastmasters club, ORA*TORS. It is part of Competent Communicator certification offered by Toastmasters. Hope you find it useful. The above two quotes from Mahatma Gandhi emphasizes on the importance of cleanliness and the dignity of labour. B M Giriraj’s latest venture, Amaravathi precisely portrays our attitude towards both. In 2012, stink of Bengaluru’s garbage reached New York and London. Common perception about it was the mismanagement of waste. But few know about the mistreatment of men, who keep our cities garbage and filth-free – garbage collectors and sanitary workers. With realistic portrayal, they find their voice in the movie. 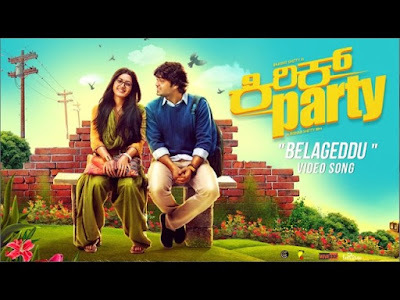 belageddu yaara mukhava naanu noDide - song from Kannada movie, Kirik Party is breaking all records in recent times to become the most popular song on internet. It has already crossed 5 million views on youtube. Here is the translation of its lyrics. Hope you enjoy understanding one of the finest composed songs in Kannada. English Translation : whose face did I see after waking up in the morning? English Translation : caress me, oh!... can’t stand being tickled! As I had seen the video songs of Kirik Party before the release, I had some assumptions and expectations about the plot. Few assumptions did come true but I cannot say the same about the expectations. Film is largely focusses on mischiefs of the last benchers and college gang wars. In between, Kirik Party tries to raise an issue, which is considered taboo. The film is a nostalgic trip back to the engineering days. Freshers taking on the seniors, pranks played, crushes, college fests delight the audience. You could also be jotting down points in your mind when there is an argument regarding which branch of engineering is best. Songs, which were already a hit add to the scintillating portrayal. Brilliantly composed, Katheyonda Helide Bari Guruthugale College Ali will sure be heard in college farewells. Belageddu Yara Mukhava Naanu Nodide is well written and depicts a love story in its own way. But the voilent college gang war is a drag at times. Overenthusiastic mechanical professor trying to analyze mechanical problems becomes irritating. The video songs released before the release of the movie, tell bits and parts of the story. So, this has taken out the thrill of understanding the plot details for the first time in theatres. Moreover, movie does not have a great plot. It survives only on dialogues and heroism. In few scenes, I felt Yogaraj Bhat’s style of depicting blossoming love between hero and heroine, which does not enthrall much. So, though the film brings back memories of college life, it fails to engage the audience all the time and entertains only in parts.